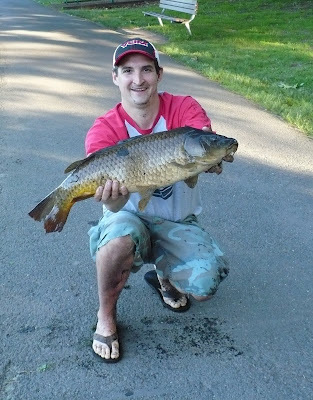 Although this is not the first carp I have caught this year, it's the first that I've caught while I was actually fishing for them. This was a huge victory and a lesson in failure, persistence......and fishing. Putting aside the day a carp ate a hunk of my Yum Dinger, I had no less than a half-dozen failed attempts at catching a golden-boy in the last couple of months. I could have easily given-up, and almost did, but I kept compiling information, trying different things and most importantly, spending time on the water. I think that most people don't take to fishing because they expect to catch fish. Most of the time, that's not the way it works. If it were easy to catch fish, then I probably wouldn't do it. For me, the fun is in figuring it all out. If something doesn't work, I ask myself why it didn't work and what I can do differently. If I don't know something, I ask someone. I spend a lot of time on Google. For me, that's what it's all about. It's much more than the thrill of reeling in a 10+pound carp. I find the satisfaction in figuring out how to make a fish bite and investing the time to give one the chance. Nothing is more rewarding than failing, persisting and then finally succeeding. This was a special fish. Next Up: A day in Bergen County involving some volunteer work.